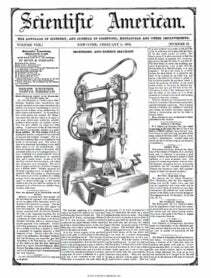 The annexed engravings are views of a machine for plastering the walls of houses, invented by Isaac Hussey, of Harveysburg, Warren Co., Ohio, who has taken measures to secure a patent for it. Figure 1 is a perspective view, exhibiting the machine plastering over-head, and fig. 2 [ is a vertical section of part of the plastering box. The same letters refer to like parts. This apparatus consists of a frame resting on rollers or small wheels, and capable of being easily drawn across a floor ; it has a mortar box capable of being elevated to the top of the frame, so as to project the mortar on the ceiling or roof of a room, by a piston acting on the mortar in the box; and then it is scraped and smoothed by an edge tiowel, as the machine is moving along. A A is the main frame; B B are the castors or rollers; C is an adjustable pulley frame, which is arranged to move up and down ; D D are pulleys on the frame; E is a cord passing over them, from the windlass or drum, F. This cord is attached to the mortar box, G, which is capable of sliding up and down in vertical standards, a a, which have guide slots in them. This pulley frame is made to slide horizontally by the lever, I, which keeps the mortar box against a side wall, when the operation of plastering is being carried on, and it also operates the rod, J, and piston, K, seen in fig. 2, which works in the mortar box, and which, by pushing backwards and forwards in said box, forces the mortar up-waids against the roof out of a narrow opening in the top of the box, and then by moving the frame along the floor, the trowel, L, situated at the back of the box, scrapes the mortar smooth to any line of depth, according as it is made to project above the cover of the mortar box. It is therefore capable of being set to any height, for this purpose, above the top of the mortar box, in the groove, e e, of the bar, d. The mortar box is attached to a sliding piece, b, which has two grooves, in which the rails; a a, slide, to allow the mortar box to be raised and lowered by the cross-piece, 6, moving on these rails. M is a slide working in a groove, /, in the sides of box G. This slide closes the throat of the box, by working the lever, 0, through the cord,g-, which theoperator draws at his pleasure. In fig. 2, the box is shown full of mortar, and the edge of trowel L, shown projecting such a height as to smooth the plaster nearly on a level with the top of the box. This trowel, according as it is set, serves to regulate the thickness of the coats. It will be understood that, by operating the belt, N, so as to slacken off the cord, on drum F, the mortar box, when empty, descends, where it is filled by the operator on the floor; by putting the feet in the openings in the belt, or by having a handle, on the lower drum, the box full of mortar, is then drawn up to its proper position for plastering on the top of the frame, when the operator commences to plaster by operating the * lever, I, which actuates the mortar piston, K, and forces the mortar against the roof, as described, and as the frame is move along on its wheels, the trowel, L, scrapes the mortar in line and smooths it. For first, second, and third coats, the trowel is set to regulate their thickness. The mortar box is capable of being set in the Irame (tipped over on its side from itsipresent position) so as to plaster side walls. The mortar scraped off by the trowel on the roof, falls on the top of the box. The operator stands down below, and requires no skill to operate the machine or put on his plaster; any laborer could do the work. More information may be obtained by letter addressed to Mr. Hussey.